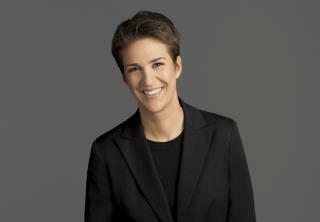 (Newser) – Since it first took to the air in 1996, MSNBC has been deep in the fray, vying for coveted ratings in the fiercely competitive cable-television arena. Twenty-one years later, it has finally nabbed a big one: the biggest weekday prime-time cable audience, not only against news networks, but all networks on the cable landscape. Per Deadline, MSNBC posted a weekday prime-time average of 2.34 million viewers during the week of July 17 through 21, besting Fox News, which came in that week at 2.25 million. The Disney Channel came in third, with 1.74 million, per Fortune. The Hollywood Reporter notes that MSNBC has come ahead of both Fox and CNN before during the 8pm to 11pm weekday slot—once in 2012, then again this May—but it didn't surpass other non-news networks like USA and TNT. Her election-night "coverage" was hilarious; every time Trump took another state her smirk was slowly changing to disbelief. Check out the YouTube videos: https://www.youtube.com/watch?v=ciCyEmGQ0k0 Great stuff! Transparency and lying are all the same to MSNBC.